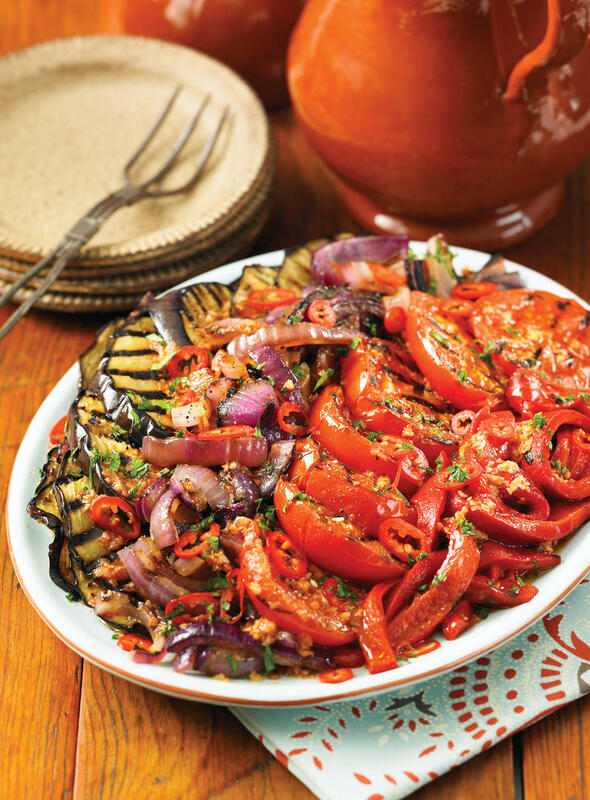 This grilled vegetable salad is a specialty of Catalonia. The name escalivada means “to cook in ashes,” so for the most authentic smoky flavor, roast the vegetables on a barbecue. Brush olive oil over eggplant, bell peppers, red onion and tomatoes. Place on preheated barbecue and cook, turning occasionally, until nicely charred. When bell peppers are done, place in a bowl and cover with a plate. Set aside to sweat. When bell peppers are cool, lift off the skins, seed and cut into strips, reserving accumulated juices. When the onion is cool, cut the rounds into quarters. Dressing: In a small bowl, combine vinegar, ñora pepper and salt, stirring until salt is dissolved. Add garlic and reserved juices from roasted peppers. Whisk in oil. Arrange vegetables on a platter. Drizzle dressing over top. Season to taste with salt and black pepper. Sprinkle with parsley and finger chile. Set aside at room temperature until ready to serve. If you do not have a barbecue, grill the vegetables on a preheated grill pan over medium-high heat, in batches, or broil on an ungreased baking sheet under a preheated broiler. Ñora is a type of pepper that is associated with Catalonia. It has a rich, sweet flavor. If you can’t find it, sweet paprika (preferably Spanish) works just fine. If you want to add a bit of smoky heat to this salad, add 1/8 tsp (0.5 mL) hot smoked paprika to the dressing. Garnish with sliced black olives. Or substitute fresh lemon juice or sherry vinegar for the red wine vinegar.